Five University of Toronto professors were recognized this week as the university's newest University Professors, an elite designation bestowed on a small number of faculty members. Shana Kelley, John Kloppenborg, Tania Li, Douglas Stephan and Stephen Scherer were honoured at a reception on Monday for their productive and influential academic careers. University Professors are chosen for their unusual scholarly achievement and pre-eminence in a particular field of knowledge. “Our five honorees are global leaders who each have had a profound impact in their respective fields and on society more generally,” said U of T President Meric Gertler. 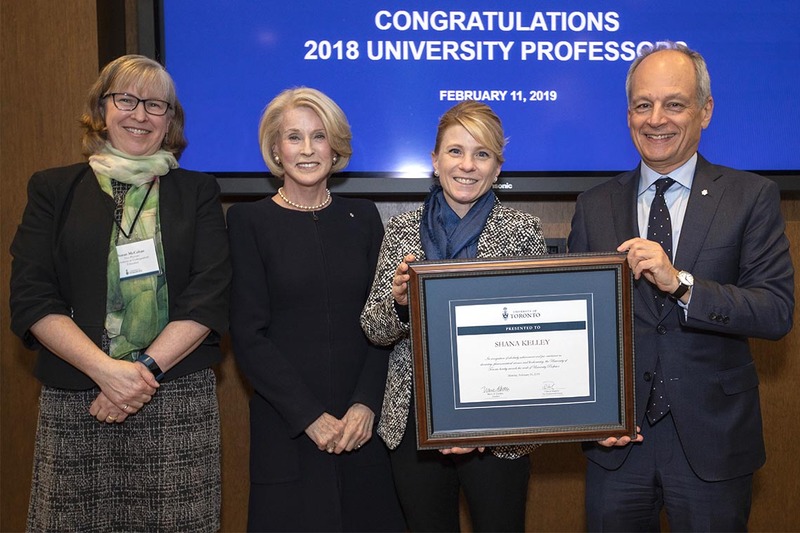 The five faculty members were presented plaques by President Gertler, Chancellor Rose Patten and Susan McCahan, U of T’s vice-provost of academic programs. Between them, the five new University Professors have garnered five honorary degrees, four Royal Society of Canada fellowships, three Canada Research Chairs and two Steacie Prizes – which recognize a person under 40 who has made notable contributions to scientific research in Canada. “For as long as I have been closely associated with the University of Toronto, I have had such a keen interest, and inspiration really, about the great talent that is here,” said Chancellor Patten. “It’s uplifting and very humbling, to hear all you’ve done, to see all that you’re doing, to hear your fine words. Shana Kelley, from the Leslie Dan Faculty of Pharmacy, is a trailblazing chemist who has pioneered nanotechnologies for new clinical diagnostic approaches to combat cancer and infectious diseases. Her research, which has been published in dozens of prestigious journals, was behind two molecular diagnostic companies she co-founded – GeneOhm Sciences and Xagenic. “When I told my parents, they said, ‘You’re a university professor? Haven’t you been doing that for a while?’” joked Kelley prior to the ceremony. “The thing that is very special about it is that it’s your own colleagues who have decided that you’ve achieved this rank. John Kloppenborg, from the department for the study of religion, is considered one of the leading academics on the origins of Christianity and the New Testament. A 13-time winner of the Dean’s Special Merit Award, he has supervised 28 doctoral students and was an associate editor for a number of major journals in his field. “When you look at the list of people who are University Professors at the University of Toronto, 50 of them right now, those are astonishing people who have done amazing things. A globally recognized anthropologist, Tania Li has investigated land tenure, forest politics, food security and global development. With a particular focus on Indigenous highland communities in Indonesia, Li's three award-winning books have been used in classrooms worldwide. She was honoured last year with the 2018 Insight Award from the Social Sciences and Humanities Research Council of Canada (SSHRC) – the first U of T researcher to receive this award. Li, who has worked abroad and been recognized globally for her scholarship, is pleased about being honoured by U of T.
Stephen Scherer is one of the top genetic researchers in the world, co-founding and leading the Centre for Applied Genomics at the Hospital for Sick Children, which recently defined genetic factors identifying autism – 300 scientific papers have documented this work, with about 20,000 citations. He is internationally known for his work studying the structure and function of the human genome, especially his contributions sequencing the first genome of an individual and the human chromosome 7. Scherer is the director of U of T’s McLaughlin Centre, which seeks to advance genomic medicine through research and education. But it's the role of teacher that gives him the most satisfaction, he said. “I contribute through the research I perform but the way I give back is through the teaching and mentoring of students,” said Scherer, who teaches two courses each year. "Now I'm the one providing the environment, the nurturing – whereas, in the past, I was the student. Douglas Stephan is a celebrated chemist who is a pioneer in the field of organometallic and inorganic chemistry. His first major breakthrough was the discovery of a new class of catalysts for the polymerization of ethylene – basically affecting how plastics are made worldwide. A winner of the Steacie Prize, Stephan has authored nearly 500 scholarly articles, which have been cited more than 400,000 times. He has garnered nearly every prize possible in chemistry, but says he is humbled by this appointment. “There’s a number of University Professors in my department, in chemistry, and to be lumped into the same group as those guys is certainly an honour and humbling for sure,” he said.